Customers are responding to the all-new 2019 Subaru Forester in a big way. What’s its magic? Subaru’s Forester small SUV is the brand’s flagship model around the globe and the all-wheel-drive vehicle has a few tricks up its sleeve. What is its magic and why is it leading Subaru of America to new records? Subaru of America (SOA) reports customers snatched up record numbers of the newly-remodeled Forester and it had its best January ever. Subaru sold 13,318 units compared with 10,848 last January, a 22.8 percent increase. Without the all-new Forester leading the lineup, SOA does not have the best January in the history of the company. The new Ascent family hauler also contributed with 4,981 models sold, but the 3-Row vehicle hasn’t had a full year of sales yet. All other nameplates, including the hot Crosstrek CUV, were down in sales over the same period last year except for BRZ, up a scant 24 units. The new fifth-generation model comes with a “go-anywhere“ attitude, it’s developed for people with active lifestyles and comes standard with Subaru’s Symmetrical all-wheel-drive with all-terrain capability. Add in the Subaru Boxer engine that sits low in chassis, and you have a small SUV with superior driving dynamics. All new fifth-generation Foresters get the newly-upgraded 2.5-liter boxer engine that gets an increase in power and now produces 182 hp and 176 lb-ft of torque, versus 170 hp and 174 lb-ft in the fourth-generation Forester. Even with more power, Forester gets improved fuel efficiency for the 2019 model year. EPA estimates crept up to 26/33 city/highway mpg, and 29 combined mpg, vs 26/32/28 for the outgoing model, giving the 2019 Forester a one mpg improvement highway and combined. Most automakers don’t worry about it, but outward visibility is one of the core values for the brand and the Japanese automaker wasn’t willing to sacrifice it for a new raked roof design limiting driver visibility. Forester comes with a large, bright, and open greenhouse interior. 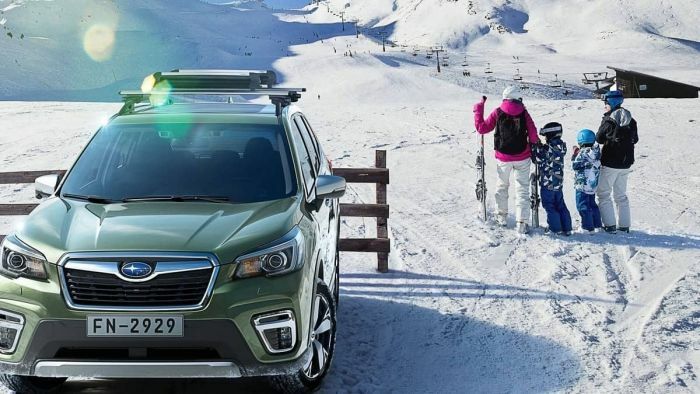 Subaru also has a goal to be the overall automobile safety leader, and Forester is their flagship model for their new technology around the globe. Subaru spent more money on Forester’s new safety technology than any other nameplate and all trims come standard with EyeSight, and a new DriverFocus with facial recognition is standard on top-of-the-line Forester Touring trims. The new 2019 Subaru Forester finished last year as one of America’s hottest selling new vehicles, and it starts the new year off with a bang. Customers are drawn to the Forester because of its all-weather, all-terrain capability, improved fuel mileage, excellent visibility, and standard safety features. It’s a formula that’s working for Subaru. And its 1 of the few 2019 models that stll comes with a CD player. This is MY reason for discovering Suburu. Big mistake by other car manufacturers eliminating a CD player. One of the best vehicles I have ever purchased, it has put the joy back into driving. Even driving in 'stop and go' traffic on California's freeways is less of a chore. Really looking forward to the springtime when I can get off-road a bit and pursue my photography. Like chalk from cheese compared I was driving before. Well hear this, Denis: I have one, a 2019 Forester, and I hate it and wish to heck I'd bought a Jeep. What do I hate? Too-small seats, stop-start ststem, too-short console and arm rest, quasi-hidden cup holders, confusing display, confusing radio, Overly-tall lip at floor entrance, making it difficult to enter for any but the limber. I absulutele don't recommend it , Denis for any but the young and athletic. My only let down was Subaru made a Sport model Forester that made me thrilled and excited, but when I found out that they would not be making them with a 6 speed manual matched with a turbo boxer engine I suddenly lost interest in buying a 2019 Forester Sport. All’s well cause when I went to my local Subaru dealer and went inside I saw a sedan that was unbelievable gorgeous metallic blue, started to take a closer look and it was a 2018 WRX limited 50th anniversary edition in heritage blue and I got my 6 speed manual with a turbo boxer engine. This makes the 3rd Subaru in my family and couldn’t be any any happier, it puts a smile on my face every time I drive it.